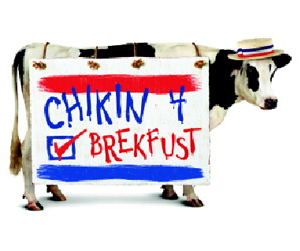 ATLANTA (Aug. 29, 2011) - The Chick-fil-A "Eat Mor Chikin®" Cows are asking customers to vote "Chikin 4 Brekfust." To help the Cows along the campaign trail, Chick-fil-A® is treating customers to breakfast the week of Labor Day at its restaurants nationwide. Beginning today, Chick-fil-A patrons can visit http://www.chick-fil-aforbreakfast.com/ to reserve the free Chick-fil-A® breakfast entrée of their choice. Reservations may be redeemed Sept. 6 - 10 during breakfast hours (6:30 to 10:30 a.m.) at the selected restaurant by presenting a printed copy of the personal invitation received upon making a reservation on the website. The offer is limited to one free breakfast entrée per customer, per restaurant during the five-day period. Offers and availability may vary at participating locations. Customers will have up to nine breakfast entrées to choose from, including the Chick-fil-A® Chicken Biscuit, Spicy Chicken Biscuit, Sausage Biscuit, Chick-fil-A Chick-n-Minis™ (three-count), Chicken, Egg & Cheese Bagel, Bacon, Egg & Cheese Biscuit, Chicken Breakfast Burrito, Sausage Breakfast Burrito and the new Multigrain Oatmeal. Entrée choices may vary by restaurant. While the free breakfast giveaway will showcase Chick-fil-A's diverse menu options, the promotion also gives the chain an opportunity to highlight its latest breakfast menu addition, Multigrain Oatmeal. Introduced nationally in July as an option for its health-minded customers, Chick-fil-A's Multigrain Oatmeal is slow cooked in kettles to retain the nutritional value naturally found in oats. The mixture is a combination of steel-cut oats, rolled oats, flax, buckwheat flour and whole wheat flour. Customers can choose one of three toppings, including cinnamon brown sugar, roasted mixed nuts (almonds, pecans and walnuts) or a dried fruit blend (cranberries, blueberries, golden raisins and cherries).